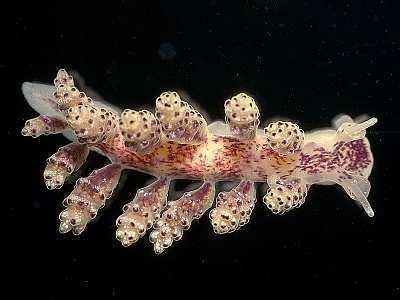 Description: The nudibranchs called by this name are probably an aggregate species consisting of Doto species which share the characteristics of red pigment spots on the tips of the ceratal tubercles and red pigment in the pseudobranch region on the inner face of each ceras. There are red to maroon pigment spots or streaks on the body. The smooth rhinophores have sheaths with dilated margins. The body is translucent white. Typically about 10mm in length. Habitat: Individuals of this complex have been taken on a variety of hydroids. The spawn consists of a ribbon which is laid in a concertina fashion. Distribution: A common species recorded from all round the British Isles. The type locality is on the Dutch coast and records from the North Sea associated with Eudendrium would be of great interest. Similar Species: The newly described species Doto hydrallmaniae and Doto sarsiae have only recently been separated from this complex by electrophoretic methods. It is likely that other morphs are also good sibling species. Translucent white body with red or maroon pigment streaks. Cerata with spots of red pigment at the tip of each tubercle, and red areas on their inner faces. Picton, B.E. & Morrow, C.C. (2016). Doto coronata (Gmelin, 1791). [In] Encyclopedia of Marine Life of Britain and Ireland.